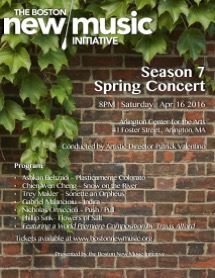 This concert will also feature the World Premiere of Altered States by Travis Alford, winner of our Commissioning Competition. Ashkan Behzadi is an Iranian composer residing in New York City. He is a graduate of McGill University in composition and music theory where he studied with Chris Paul Harman, Brian Cherney, Philippe Leroux and Sean Ferguson. Prior to this he also earned a bachelor's degree in architecture from Tehran University. Ashkan’s music has been performed by various ensembles internationally, including Exaudi, Wet Ink, Talea, le Nouvel Ensemble Moderne (NEM), Esprit Orchestra, etc., and also featured on such festivals as Manifeste 2014 at IRCAM, CIRMMT, the New Wave Young Composers festival in Toronto, The American Academy at Fontainebleau, and Domain Forget new music programs. He has won 2015 ACF Showcase competition, the Prix de Composition at Fontainebleau in 2013, two SOCAN Foundation awards in 2011 and 2012, etc. Ashkan is currently pursuing his doctoral studies in composition at Columbia University with Georg Friedrich Haas. Chien-Wen Cheng received his D.M.A. in Music Composition at the University of North Texas (2007), specializing in interactive computer music composition. Currently he works as full-time assistant professor of the Department of Interaction Design at National Taipei University of Technology in Taiwan. He has won numerous composition awards and honors including: winner of the NTSO (National Taiwan Symphonic Orchestra) composer commission competition (2013); winner of the 2012 TMC international Composition Competition (Taiwan); third prize in 2011 NTSO orchestral composition competition (Taiwan); first prize in the “2007 Voices of Change Young Composers Competition” (USA); second prize in the “2006 Fine Arts Creation Award” (Taiwan); fourth prize in “The 3rd Percussion Music Composing Competition” (Taiwan, 2005); selected work in the 2002 orchestral call-for-scores competition in “Tune in to Taiwan – Taiwan Composers Series”; fourth prize in the “2000 Hakka Vocal Music Composition Contest” (Taiwan); first prizes (2005, 2006) and second prize (2007) in the On-line Art Creativity Competitions (Taiwan); ICMC 2008 Regional Composition Prize (UK); honorary mention in Musica Nova International Competition of Electroacoustic Music (2011), and finalists in Musica Nova International Competition of Electroacoustic Music (2010), Città di Udine International Composition Competition of Electroacoustic Music (2010), Bourge International Composition Competition (2009), and VI Concurso Internacional de Miniaturas Electroacusticas 2008 (Spain). His electroacoustic works were also included in ICMC, SEAMUS, and Computer Music Journal DVD and CD releases. The music of composer Trey Makler explores vibrant colors and the organic development of sound and texture through blurred rhythms, lush harmonies, and angular gestures. Makler has received commissions from the Sheldon Concert Hall, the Charlotte New Music Festival, and the Mizzou New Music Initiative. His work Elysium was a national finalist for the 2015 MTNA Young Artist Composition Competition and was recently selected for performance at the University of Nebraska – Kearney New Music Festival. An avid collaborator and oboist, Makler has worked with dancers, writers, and visual artists on multiple collaborative projects and regularly performs with various ensembles in the Columbia area, including the Exit 128 contemporary chamber orchestra, of which he is a founding member. He has also served as a production coordinator for the Missouri International Composer’s Festival, assisting in logistical planning and event management for the duration of the festival. Makler is currently a student at the University of Missouri where he studies composition with Drs. W. Thomas McKenney, Stefan Freund, and William J. Lackey, and oboe with Dan Willett. His upcoming projects include Hatrack, a one-act chamber opera with libretto by Katie Kull, based on an essay by Herbert Asbury about the oppressive religious culture of rural Missouri in the early 20th century, set to premiere May 2016 at the Missouri Theater in Columbia, MO. Travis Alford is a composer, trumpeter, and improviser whose music has been widely performed at such venues as the June in Buffalo Festival, the Composers Conference at Wellesley College, New Music on the Point, Symphony Space in NY, the Auditorium Sede Museale di Santa Caterina in Treviso, Italy, and the International Trumpet Seminar in Kalavrita, Greece, by groups including the Meridian Arts Ensemble, Talujon Percussion, the Lorelei Ensemble, the Genkin Philharmonic, Wild Rumpus New Music, the East Coast Contemporary Ensemble, L’Arsenale, and members of the JACK Quartet and Talea Ensemble. He has also received recognition for his work from the League of Composers/ISCM, ASCAP, the Society of Composers, Inc., the Atlantic Center for the Arts, the American Composers Alliance, and the Brandeis Office of the Arts. As a performer, Travis is committed to the promotion of new music, and has played trumpet with the Boston New Music Initiative, the Equilibrium Concert Series, New Music Brandeis, and the New England Philharmonic, among others. Being a North Carolina native, he can also be found blowing on the harmonica from time to time. Travis currently teaches at Johnston Community College in Smithfield, NC, and has held previous positions at the Massachusetts Institute of Technology, Brandeis University, and Gordon College. He holds degrees in theory and composition from Brandeis (PhD, '14), the New England Conservatory (MM, ’08) and East Carolina University (BM, ‘05). He lives in West Newton, MA with his wife Lauren, his son Owen, and his dog Toby. Phillip Sink was born in 1982 in High Point, North Carolina. In 2004, he received bachelor’s degrees in music composition/theory and music education from Appalachian State University. From 2005-2009, Phillip taught middle school orchestra and band in Charlotte, NC. In 2012, he earned master’s degrees in music composition and music theory pedagogy from Michigan State University where he served as a graduate assistant in music theory. Phillip’s music has been performed in the U.S. and Europe and at many conferences and festivals including: 2015 Aspen Music Festival, 2015 Art and Science Days, Bourges, France; 2015 SEAMUS conference, 2015 N_SEME, 2014 Electroacoustic Barn Dance; 2012 World Saxophone Congress, 2012 NASA (North American Saxophone Alliance) national conference. Other honors include winning the 2015 Dean’s Prize for chamber music at Indiana University, 2015 Innovox Ensemble’s Green Call for Scores, 2013 Kuttner String Quartet Composition Competition, 2013 NOTUS Prize. Most recently, Phillip attended the 2015 Aspen Music Festival as a composer fellow. Phillip is currently a doctoral fellow at the Jacobs School of Music where he is pursuing a doctoral degree (DM) in music composition with minors in electronic music and music theory. At Indiana University, he served as an associate instructor of composition where he taught courses such as Free Counterpoint, Notation, and Composition for Non-Majors. He studies electronic music with Jeffrey Hass and John Gibson. He studied acoustic composition with Claude Baker, David Dzubay, Aaron Travers, Sven-David Sandström, Ricardo Lorenz, Jere Hutcheson, and Scott Meister. In 2001 Gabriel Mălăncioiu began the study of composition under the direction of Remus Georgescu, and in 2005 he began to attend the MA in composition under the direction of Cornel Tãranu. In 2011 he completed his PhD in composition with the thesis "Aspects of the sacred / profane relation in my own music" under the direction of Adrian Pop. His works have been performed in concerts in Romania and also in USA, New Zealand, Austria, Germany, France, Norway, Italy, Ireland, Ukraine, Scotland, Macedonia, Poland and Hungary Neue Vocalsolisten Stuttgart, Ensemble Aventure, Hand Werk, L’Arsenale, THReNSeMBle, Trio Contraste, Florian Mueller (Klangforum Wien), Bjorn Wilker (Klangforum Wien), Richard Craig, Bruce Curlette, Gianluca Ruggeri, Luca Piovesan and conductors such as Nigel Osborne, Michael Wendeberg, Eduardo Narbona, Filippo Perocco, Remus Georgescu amongst others. Some of his works were released by Ablaze Records (USA), Col Legno (Austria) (digital release), Stan Music (Germany) and Blowout Records (Italy). He is member of SACEM and of UCMR. Gabriel Mălăncioiu is currently teaching Composition Techniques and Musical Analysis at the West University of Timişoara, Faculty of Music and Theatre. Nick Omiccioli is a heavy metal guitarist living in a composer’s body. He incorporates elements of rock and metal music into his compositions through the use of driving rhythms, visceral energy, melodic hooks, and virtuosic instrumental writing. Nick’s music has been performed all over the world including Canada, the United Kingdom, Italy, Austria, Lithuania, Thailand, New Zealand, China, Sweden, and throughout the United States. He has composed for some of the leading ensembles of today such as Alarm Will Sound, the Jasper String Quartet, The Berkeley Symphony, the Aspen Contemporary Ensemble, le Nouvel Ensemble Moderne, l’Orchestre de la francophonie, and Third Angle Ensemble. Nick has received commissions by the Wellesley Composers Conference, the Aspen Music Festival and School, Shouse Institute at the Great Lakes Chamber Music Festival, National Arts Centre in Canada, and others. In addition to receiving many national and international honors, he was recently awarded a 2013 residency at Copland House and was a finalist for the 2013 Rome Prize. His primary composition teachers include James Mobberley, Chen Yi, Zhou Long, and Brian Bevelander. Nick is a freelance composer and his music is currently self-published. To find out more, please visit www.nicholasomiccioli.com. Plasticamente Colorato (plastically colored) was composed by juxtaposing and superimposing synthetic pitch collections, contrasting textures, and diverse timbres to artificially color or morph the music as an expression of plastic feelings. This piece is inspired by the poem Snow on the River written by Chung-Yuan Liu, a Chinese poet in the Tang Dynasty. The poem reads: A hundred mountains and no bird, A thousand paths without a footprint; A little boat, a bamboo cloak, An old man fishing in the cold river-snow. The music is intended to portray the solitude reflected in the imageries of the poem, and also to depict the poet’s sorrow which he tried to alleviate by enjoying the beauty of the nature. The music starts with slow pitch movement to present the solitude reflected in the imageries of the poem. Later on, the music gradually turns into agitated expression through passionate cello melody and superimposition, which presents the constrained sadness of the poet due to his demotion ordered by the emperor in a political struggle. The prominent pitch set in this piece is (0 1 6 7) and the interval of diminished fifth or augmented fourth derived from it is frequently used throughout the piece to maintain its coherence. Besides, timbral and pitch interpolation are used as the main elements to make the music flow. The first text of Rilke’s masterwork Die Sonette an Orpheus details Orpheus’ voice and its power to uplift all creatures of Earth. I sought to capture the vibrancy and energy of creation in my music, with a contrasting section of stillness and tranquility, ultimately closing with a burst of energy and a final moment of repose. A tree sprang into life. O clear transcendence! a virgin start, and change was everywhere. of chaos, in their ear you built a temple. In Black Arrow, written for bass clarinet and electronics, bass clarinet solo part consists of three ideas as follows: the quiet timbral trills, abrupt slap tongues in low register and ghostly fleeting key slap scales. The whole piece develops around or between these three gestures turning on themselves or going through transformations. The latent energy seems to waver in a very low register but gradually the sounds creates a space filled with a strong directional kinetic energy. The succession of rising scales, lofty multiphonics and huge intervallic portamenti intensify the energy and constantly keep up the extreme tension. The source of the sound comes only from bass clarinet in order to create unified sonic world between the electronic part and instrumental part. The electronic part of the piece realized at the electroacoustic music studio at the University of York and at the composer’s home studio. Black Arrow was completed on the Greek island of Crete in early 2005 and received its first performance on 11 March 2006 at the International Electroacoustic Music Festival Spring in Havana, Cuba. It lasts about 7 minutes. The piece is dedicated to Sarah K Watts. Flowers of Salt. Recently, engineers at Harvard University sprouted “nanogardens” by manipulating the environment surrounding a salt and silicon solution. This process produced magnificent microscopic flower-like structures on the surface of a penny. For me, images of the delicate sculptures evoked organic and fragile music with much filigree. In an effort to capture this imagery, I began the piece with a single three-note chord, which acted as the kernel that produced many motives later in the piece. From this starting point, I attempted to construct a form that would take time to crystallize, in that when the conditions were just right, musical motives would burgeon forth from all directions. The purpose of this work is that of directing the consciousness into a place of unity, of beauty and silence, inherent to every human form, Indira being the Sanscrit term for “Beauty”. That place of unity if intended to be attained through the dynamic balance of polar opposites such as continuity versus discontinuity, etheric versus dense textures, linear versus circular temporality, dynamic and timbral contrasts. Push/Pull was commissioned by the Aspen Music Festival and School for the Aspen Contemporary Ensemble and later expanded for Ensemble Paramirabo (Montréal, Québec). The work is an exploration into the composer’s musical roots associated with rock and heavy metal music. While not being a direct translation of the rock idiom, push / pull evokes the visceral energy attributed to that music. Not only does the mood shift between a pushing and pulling of energy, the larger musical sections also expand and contract—repeating in lengthened, shortened, or in exact repetitions of their original forms.